Thua Thien-Hue (VNA) – The Thua Thien-Hue provincial People’s Committee and national flag carrier Vietnam Airlines signed on August 11 a cooperation agreement on promoting tourism development in the Hue ancient imperial city. Accordingly, the provincial administration and Vietnam Airlines will increase promotion activities for Hue on their respective communication channels and collaborate to organise national and international tourism, cultural and sports events in Hue city. They are set to work together to support Hue’s investment and tourism promotion activities at travel fairs in Vietnam and other countries. They will also consider raising the frequency of flights, opening new air routes to Hue, and creating mechanisms to support new air routes in their initial stage to increase the number of passengers. 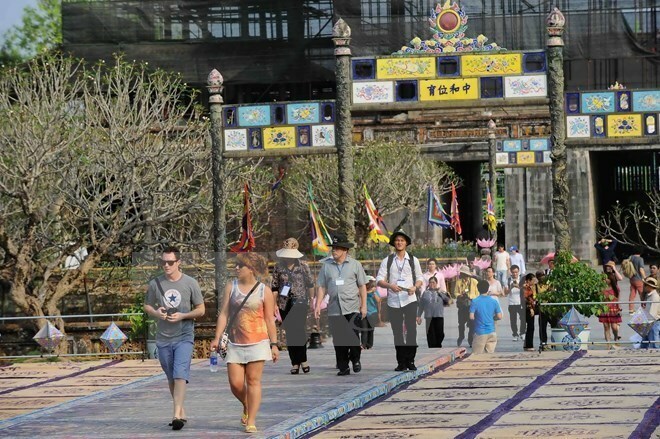 Thua Thien-Hue and Vietnam Airlines are going to organise trips for reporters and travel companies from Europe, Northeast Asia and Oceania to learn about local tourism potential and investment climate. Chairman of the provincial People’s Committee Nguyen Van Cao said aviation helps shorten distance and make destinations closer, thus helping to attract more tourists to the former imperial city of Hue. This cooperation programme will help foster tourism and investment attraction activities as well as cultural exchange between Thua Thien-Hue and other regions of Vietnam and countries around the world, he added. Vietnam Airlines is operating several direct flights linking Hue with Hanoi and Ho Chi Minh City a day.